The civic organizations behind Free Ride Everywhere Downtown, or FRED, consider the program a success and are even discussing expanding it. But for all the benefits, the trips cost more than twice that of a ride on public transportation. It turns out, free rides come at quite a cost. Two years ago, San Diego debuted its newest transportation option. Free Ride Everywhere Downtown, or FRED, moves people from anywhere to anywhere in the downtown area at no charge, using electric golf carts. The program, a hybrid between a public option like a downtown shuttle and private alternatives like Lyft and Uber, lets riders call for rides on a mobile app or hail them like a taxi. It’s all funded through downtown parking revenues, and is supported by advertising sold on and in the cars. Two years in, the civic organizations behind it consider it a success and plan to add cars. They’re actively discussing whether to let drivers take riders outside downtown to destinations like Balboa Park and Barrio Logan. Roughly 170,000 riders are expected to use FRED this year. But for all the benefits, the trips cost more than twice that of a ride on public transportation. Every time someone gets on a bus or light rail operated by the Metropolitan Transit System, it costs about $2.71, according to 2016’s National Transit Database. MTS is an especially efficient system; the statewide cost per rider is closer to $3.70. FRED’s cost per rider dwarfs those numbers. Right now, every time someone gets in a FRED, it costs more than $6 per rider, based on budget and ridership information from Civic San Diego, the city-owned nonprofit that administers the program. It has cost $6.67 per rider since it launched, but for this year could reach as low as $6.06. He also said the high cost isn’t particularly surprising. That’s because fixed-route transit operations, like a bus or light rail line, are more cost effective than point-to-point solutions, like FRED, Lyft or a traditional taxi. The problem, Walker said, is fundamental to the service’s design. It’s a point-to-point service – or one that takes people from any place they choose, to any place they choose – and uses cars that can only fit a few riders at a time. Colin Parent, executive director of the mobility-focused nonprofit Circulate San Diego, thinks the numbers are clear: FRED is a bad deal. “The figures show that FRED is just dramatically more expensive per rider any other transit option in the region, and it doesn’t seem like a good use of public resources,” he said. Walker said FRED is failing on the standards by which transit options are typically judged. Those behind the program – Civic San Diego, the Downtown Partnership, which is in charge of marketing and promotion, and Free Ride San Diego, the company that operates the service – concede the program is not as cost effective as other public transportation programs. But they say it increases mobility for people who live, work and visit downtown by offering another more flexible option. They argue they’re experimenting with new solutions at a time when transportation is changing rapidly. Ben Verdugo, who manages FRED for Civic San Diego, emphasized that ridership is growing. Last month was its highest ridership month ever (17,683 riders), and he now projects it will move 173,000 riders this year. That’s below the 180,000 riders it had forecast in a report to Civic San Diego’s board in November. But to Verdugo, its reasonable to expect continued growth as downtown is expected to continue shouldering a disproportionate share of the region’s growth in housing, jobs and hotel rooms. But on the question of its cost competitiveness, Verdugo argued it’s unfair to compare the service to public transportation because the two are fundamentally different. “FRED is not intended to move people from one community in the region to another community in the region, but to serve as the first mile or last mile within the confines of a specific community such as downtown,” he wrote in a statement. Urban planners have long struggled with the so-called first mile-last mile problem: getting people the rest of the way to or from the closest transit stop to their work or home. Verdugo said Civic San Diego leadership remains confident FRED will grow into that role downtown – and he emphasized that all of the city’s adopted plans for downtown envisioned a shuttle to move people around the area. That points to the origin of FRED. It was initially conceived as a free shuttle that would operate on a fixed route throughout downtown. MTS was even looped in to initial conversations about potentially operating it, said MTS spokesman Rob Schupp, but planners there determined that a network of fixed-route shuttle busses would be pricey, at roughly $3 million per year. When Civic San Diego put out a request for bids, Free Ride San Diego won with its more flexible, point-to-point proposal. Verdugo said the start-up and operational costs of the original idea were just too high. Juan Matute, associate director of UCLA’s Institute of Transportation Studies, said he’s a believer in FRED’s model; the company runs the same service in Santa Monica and has achieved a lower cost per rider. He said it’s effectively an electric jitney, small busses that carry a few passengers on fixed routes that have been largely regulated out of existence. But San Diego’s service could stand to lower its cost per rider, he said, and one option for doing so is creating a fixed-route system using FRED’s existing cars. It could create a handful of north-south and east-west lines that run only downtown, using golf carts instead of buses. In any case, there’s no real disagreement that FRED is currently expensive, compared with other transportation options. FRED currently has a $1.2 million annual budget, though it is not on track to spend all of that this year. In November, Civic San Diego amended its agreement with the company that operates the service, bringing the five-year investment to $5.7 million. Parent said the most important fact is that the service simply isn’t paying off. “Mobility is a major need downtown, but there’s all sorts of different ways those public dollars could be spent more effectively,” he said. For one, he said Civic San Diego could simply pay for people’s Lyft rides downtown and save money. Indeed, Tuesday night during rush hour, a shared Lyft ride from Little Italy to East Village – one end of downtown to the other – would have cost just $2.82. Compare that to more than $6 the ride on FRED costs. Other, better options include using the money to help fund new or existing MTS routes or to increase bus frequencies downtown, Parent said, or follow the lead of other jurisdictions that have experimented with free fares for anyone who boards downtown. There are other changes to FRED being discussed – but none involves shifting funding to a different service entirely. Brennan said the groups behind FRED are discussing stretching its footprint into Balboa Park and Barrio Logan. The parking district in Uptown has also expressed interest. In a report given to Civic San Diego’s board last year, officials said they were actively seeking other public revenue options to help support the program. They said they’d just applied for grant funding from the California Air Resources Board to help underwrite it. Verdugo said FRED did not receive that grant, and that it also sought a grant from the San Diego Association of Governments that it did not receive. “Civic continues to look for other grant options or partners to work with,” he said. Those funding options would be especially welcome since the initial plan that revenue from ads sold on the outside and inside of FRED vehicles would eventually pay for the program isn’t panning out. 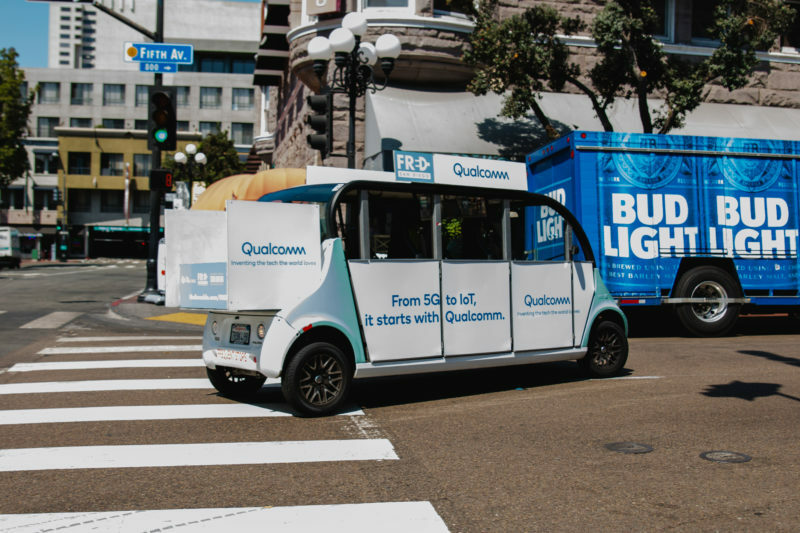 “The assumption that advertising will fully support FRED for the life of the existing agreement and anticipated extensions is unrealistic due to the scale and size of the fleet,” Civic San Diego staff wrote in its report. Each car would need to generate $5,000 in ad revenue per month for that to be viable. As of November, they were only generating $1,200 per month. FRED is also facing one other potential headwind. MTS may be forced to start regulating the service, just as it does with taxis today. Schupp said MTS has determined that FRED falls within its regulatory authority over low-speed vehicles. In May, MTS informed Civic San Diego that it needs to pay roughly $17,000 in registration fees to the agency for 20 vehicles, and will need to spend another $12,000 in fees each year going forward. The new regulatory oversight would also require that every driver is vetted and licensed by the Sheriff’s Department and attend MTS safety courses, and that FRED needs to acquire the minimum public liability insurance of $350,000. City attorneys are currently determining whether they agree with MTS’s interpretation of its regulatory authority.